A remarkable property of atomically thin transition metal dichalcogenides (TMDs) is the possibility to selectively address single valleys by circularly polarized light. In the context of technological applications, it is very important to understand possible intervalley coupling mechanisms. 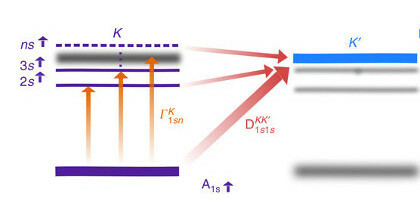 Here, we show how the Dexter-like intervalley coupling mixes A and B states from opposite valleys leading to a significant broadening γB(1s) of the B1s exciton. 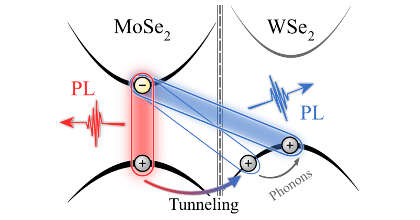 The effect is much more pronounced in tungsten-based TMDs, where the coupling excitonic states are quasi-resonant. We calculate a ratio γB(1s)/γA(1s)≈4.0 , which is in good agreement with the experimentally measured value of 3.9±0.7. 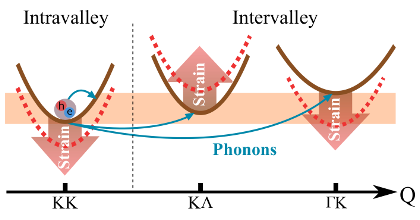 In addition to the broadening effect, the Dexter-like intervalley coupling also leads to a considerable energy renormalization resulting in an increased energetic distance between A1s and B1s states.